Boulevard | Beer Apprentice - Craft Beer News, Reviews, Interviews and Info. For today’s craft beer review I’m going to be trying a Boulevard Double-Wide IPA produced by the Boulevard Brewing Company located in Kansas City, Missouri. This is part of their “Smokestack Series” and it will actually be the first time that I’ve ever tried a beer from this brewery…. but I’ve heard good things. Let’s see if we can find some information about this brew from the website, boulevard.com. The Double-Wide comes in a 12 oz. bottle and has an ABV of 8.5%. The beer poured a hazy, deep, dark orange to amber color. It had an enormously sized, eggshell colored head that was very fluffy, frothy, soft and semi-rocky. The retention time was super and the lacing looked pretty good too. Nice looking beer here. The aroma matched the description very well. A nice hop punch by way of some grapefruit and pineapple citrus mixed with very floral and piny distinctions. Maybe even a touch of orange in there too. The caramel and toffee malts really came to life once the brew started to warm and develop. Very nicely balanced, pleasing and not overly complicated. The taste came off a little more piny than citrusy I thought. The citrus was still accounted for with the grapefruit and pineapple, but it just seemed a little more relaxed. No matter because the piny aspects were very well represented. This brew had more than enough bitterness to suit me. It seemed a touch lighter on the caramel also, however I began to notice some toasted bread crusts at the back end, which gave it a little bit more of an “earthy” and “round” flavor profile. Nice. The mouthfeel was medium bodied, slightly sticky, chewy and crisp with a light bite. A tiny bit of warmth was represented and plenty of flavor was retained and enjoyed in between sips. Well. I think we have a winner here. Well made and very nice. I think this could be a “go-to” beer for me no doubt. It was super easy to drink and it had more than enough aroma, flavor and feel to satisfy me or most any craft beer drinker I’d say. It wasn’t overly hoppy, yet it wasn’t underscored either. It sat right in the middle. I want some more. The only problem is that I can’t find it very easily. I also think that this brew could be enjoyed at anytime during the year, although it might be best suited for those warm Spring days. 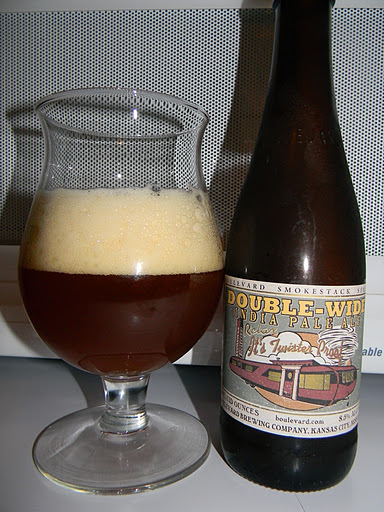 So, if you guys see the Boulevard Brewing Company’s Double-Wide IPA, give it a shot. I think you will like it. Thanks for reading and commenting folks. Have a good one. Until next time.